Design a room scheme that will really pop with this Andy Warhol inspired mosaic tile. 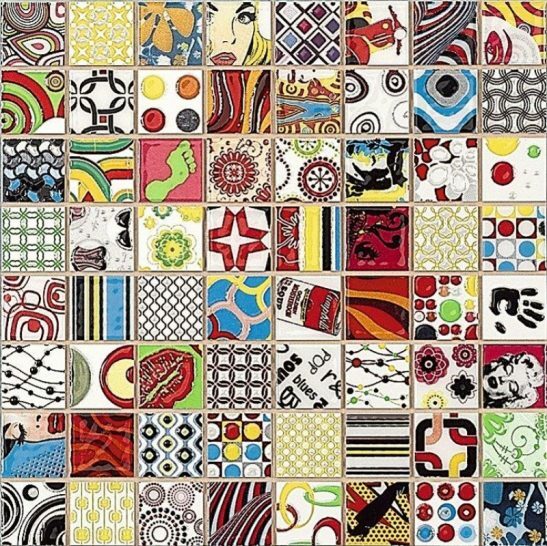 This eye-catching mosaic showcases a collection of 64 individual ceramic squares, each decorated with a different colourful artwork in the Pop-Art style. The combination of bass relief and vibrant design will help you create a signature look in your home. Use this colourful comic strip to brighten any bathroom, kitchen or wet room and allow your personality to shine. 281mm x 281mm sheet size.